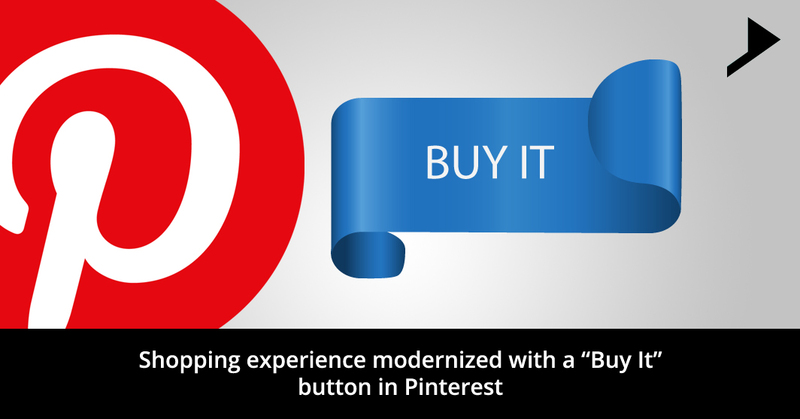 Shopping experience modernized with a “Buy It” button in Pinterest. Home / Digital Marketing / Shopping experience modernized with a “Buy It” button in Pinterest. Active pinners have continuously been looking for a way to buy clothing, recipe ingredients, home decor etc. directly within the app. Now the wait is over!! According to Pinterest’s CEO Ben Silberman, Pinterest is launching its foreseen “buy” button splashing the worldwide market of e-commerce. People who are the users of the visual discovery tool can buy products inside the application itself without leaving Pinterest. Blue says you can buy it now. Beside the red “Pin it “button, there will be a blue “buy it” button for the products available for purchasing. Pinterest has associated with a range Macy’s M + 0.84%, Bloomingdale’s, Nordstrom JWN + 0.57% and Kate Spade, as well as with Apple AAPL + 0.44% Braintree, Stripe and foremost credit card companies to add a blue price tag to loads of products featured on the app. With only a few taps, pinners will be able to purchase items without leaving the app through a protected and simple system. Industry onlookers have been waiting impatiently for this feature to come to Pinterest. The social service is positioned to become an online mall, collection of the images of the required products they might want to buy. While you get ready to check out, you can tap this Buy it button and pay with Apple Pay or a credit card. Soon, you can go back to your way to Pinning. Your personal information, will be stored so that you don’t have to thumb it again next time. This is the finale of discovery-purchase-experience flow that Pinterest anticipates to provide, though it’s all still theoretical and Pinterest hasn’t held talks with potential partners yet. Why is Pinterest planning for these kinds of buttons? It’s only because Pinterest wants all sorts of brands to pour their wares into the network and the business to motivate partners to intensify the spread of their Action button-augmented Pins by spinning them into ads. The fewer phases amid discovery and purchase, the more Pinterest can fulfill its mission and affluence its process. Subscribe our blogs and get the latest updates direct into your inbox. I think this can be one of the most vital information for me. And i’m glad reading your article. But wanna remark on some general things, The website style is wonderful, the articles is very great : D.
Just desire to say your article is as astonishing. The clearness to your publish is simply excellent and i could assume you’re an expert on this subject. Well along with your permission let me to grasp your RSS feed to keep up to date with impending post. Thank you one million and please keep up the gratifying work.